"Internet-delivered TV, which until recently was unready for prime time, is the new front in the war for Americans' attention spans. Netflix is following up on the $100 million drama "House of Cards" with four more series this year. Microsoft is producing programming for the Xbox video game console with the help of a former CBS president. Other companies, from AOL to Sony to Twitter, are likely to follow. The companies are, in effect, creating new networks for television through broadband pipes and also giving rise to new rivalries - among one another, as between Amazon and Netflix, and with the big but vulnerable broadcast networks as well." However, at its core is something I've been saying since I began this blog: Internet-delivered content, combined with the dramatic reduction in content production costs (inexpensive, high-definition video cameras, for example, can be had for a few hundred dollars these days) could soon challenge big media's dominance of TV. Indeed, what we think of as TV may already be changing. 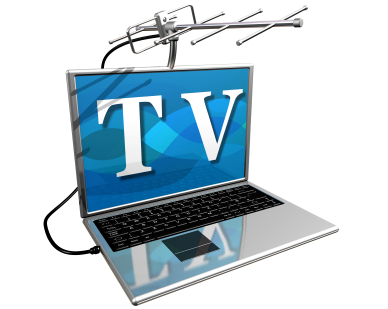 These days, many people watch shows on their tablet computers, phones, and just maybe, a traditional television, though that is not as common as it once was. Content quality for stuff distributed online, on the other hand, is literally all over the map. Some stuff is truly phenomenal, while other things are utterly disposable. Then again, the same can be said about stuff on traditional TV (I have almost no use for so-called “reality TV”). What has changed is that instead of content we watch being firmly controlled by its self-anointed gatekeepers at big media companies, there's been a much-needed democratization of sorts. Today, anyone can produce content and post it on YouTube. And, you can probably watch it on your TV if you really want. Or your laptop, tablet, smartphone or iPod (which many more are doing anyway). Incidentally, the trend of WHERE we watch TV being redefined isn't limited to the U.S. Sweden, the European country perhaps best known for progressive taxes and the one with the highest quality of life in the world (not to mention the highest levels of affluence in the world, including the über-wealthy Wallenburg family), has taken the bold step of having the TV tax assessed on taxpayers to fund Swedish state television not only on physical television sets, but now includes mobile devices like iPads and tablet computers (see http://on.wsj.com/14uSJHX for details) in recognition of the fact that more and more so-called “TV content” is now being consumed on those devices. That’s unlikely to ever happen in the U.S. where there is hardly any public support for state-funded television (PBS being a notable exception, and what exists doesn't fund anywhere near the network’s full operating expenses), but the point is that we’re no longer required to watch content on TV sets anymore. The Swedes rely on an honor system, but the fact that the Swedes are now including devices suggests where things are going. While I'm not sure we can yet say that Netflix is necessarily the next ABC, CBS, NBC, Fox or CW, we can say that we’re approaching a point where "broadcast" no longer means over the airwaves exclusively. As the lines between TV and online content blur with new TVs and devices like Roku players, we may also soon reach a point where content could be managed from our desktops rather than our cable boxes. We’re not quite there … yet. "These are the very first lab tests in a very grand experiment," said Jeff Berman, the president of BermanBraun, a media company that makes programming for NBC, HGTV, AOL and YouTube, among others. As he suggested, the competition from online content has really only just begun, but the distributors are companies including Netflix, Amazon, Microsoft and maybe Google's YouTube. To be sure, it's still pretty early. At this point, I can safely say that managing all that online content is still a VERY, very cumbersome process, and frankly, Apple's “Apple TV” device does nothing to make managing all that content any easier, it’s just another TV input and it does nothing to help organize all of the disparate content on DVDs, DVRs and online. Google did a bit better with its inexpensive Chromecast dongle (priced at just $35), but a host of others including Intel and Amazon are pursuing similar set-top box (or plug-ins) concepts. Brian Stelter, media reporter for The New York Times, says that online programming is very likely the future of television -- and that cable networks should be very wary. (Note: one of my previous posts featured an interview with Brian Stelter, see http://goo.gl/3Ic0S for details). What streamed content offers is a few things, including no need to worry about editing content that would be unable to be broadcast, as well as programming length. For a half-hour broadcast sitcom, they must allot for several minutes of commercials, which means that the programming is limited to 22 or 28 minutes. That limits what can be covered in each episode. Pay cable programming offered a way around that, and now streaming does, too. "What's lovely and what worked so well being able to work at Netflix is if a story can only bear 28 minutes that's fine, and if it needs 37 minutes that's fine. So it allows the story to tell you what it wants. That's pretty awesome, that's a great way to be able to write. I'm sure novelists have that ability to be as long as they need to be (see the interview at http://ow.ly/OB9zX for more details). The other thing is that content can be more refined to reach particular audiences. That’s created a whole new environment where niche programming can be created cost-effectively without even having a network. No longer limited to traditional confines of television production, the web has enabled a variety of shows to find audiences that way, ranging from immigrant groups, to religious groups to lesbian and gay audiences. Leon Acord who produces the web series 'Old Dogs & New Tricks' which is now entering its fourth season, told Huffington Post reporter Brad Liberti (see http://huff.to/1I8t8MT for the article) that the experience of doing a web series had its origins in regular television, but the validation was that producing a web series' had fewer of the restrictions than regular TV does, which makes it very alluring for would-be content producers. That suggests we are still in early stages for web series generally. Acord had been watching a lot of TV comedy with his father, something they’d often bonded over when Acord was just a kid. We loved 'All in the Family.' Now it was 'Two and a Half Men' in particular that his dad enjoyed, and while the Chuck Lorre half-hour comedy wasn't exactly known for its diversity and or sophistication, it did affirm one thing for the budding writer: "I had fantasized about doing a web series, but I guess I always, in the back of my head, thought, 'No, this kind of stuff you couldn't get away with,' and then watching 'Two and a Half Men', I was like, 'Oh, my god, this is raunchy and on network!'" In the meantime, sifting through all of this disorganized digital content grows ever more challenging every day. So far, Apple has done little to enlighten or turn this around. Apple TV is, at best, an Apple-branded Roku box offering no major advantages but has its characteristic higher prices. For the moment, a basic PC seems to be the best way to manage content. Maybe we’ll see some innovation in the future. However, the good news is that there’s no shortage of exciting new TV content out there for viewers.